Thanks to the ubiquity of wireless network, location has become an easily available resource to exploit when sending purchase recommendations. We rely on Fogg’s Behavior model (FBM; Fogg, 2009) and on previous research to study whether the appearance of such recommendations when the user spatially approaches a target item improves the recommendation persuasiveness. We created a virtual supermarket, where products images are displayed on posters and customers can scan products’ QR codes with a tablet to buy them. 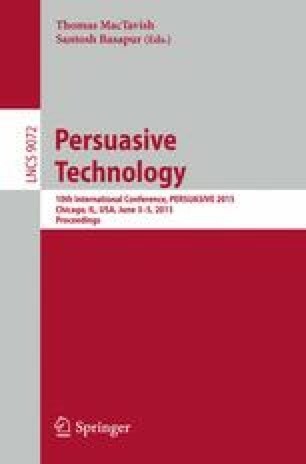 The persuasiveness of triggers co-located or not with the target product was examined, in conditions of high vs. poor motivation to purchase that product. Confirming our hypotheses, triggers co-located with the target product lead to higher sales of that product. Furthermore, participants who received a co-located trigger that also contained a motivating message purchased more items than participants in other conditions. Therefore, setting triggers to appear at a specific location proximal to the target item can change behavior, especially for motivated subjects.